At the invitation of the Hungarian government, Vice Premier of the State Council Liu Yandong will attend the opening ceremony of the third China-Central and Eastern European Countries (CEEC) Health Ministers' Forum to be held in Hungary from June 18 to June 21. The China-CEEC cooperation, which is also known as the "16+1 cooperation", is a new platform for cooperation jointly forged by China and the central and eastern European Countries and a new way for cooperation jointly blazed by China and the European countries. The cooperation in the field of health constitutes an important part in the "16+1 cooperation". The third China-CEEC Health Ministers' Forum co-hosted by China and Hungry will play an important role in expanding and deepening the "16+1 cooperation" and strengthening the public support for the China-CEEC cooperation. Based on the consensus reached by Chinese President Xi Jinping and US president Donald Trump during their meeting in Mar-a-Lago and as agreed by the two sides, the first round of China-US Diplomatic and Security Dialogue (D&SD) will be held in Washington D.C. of the United States on June 21. State Councilor Yang Jiechi will co-chair the D&SD with US Secretary of State Rex Tillerson and Secretary of Defense James Mattis. General Fang Fenghui, member of the Central Military Commission of the People's Liberation Army (PLA) and chief of the Joint Staff Department of the PLA will also attend the D&SD. The two sides will have an in-depth exchange of views on China-US relations and other important issues of mutual interest. China stands ready to work with the United States to promote the D&SD to achieve positive outcomes. Q: The 6th World Peace Forum will soon be held. Could you tell us more details? 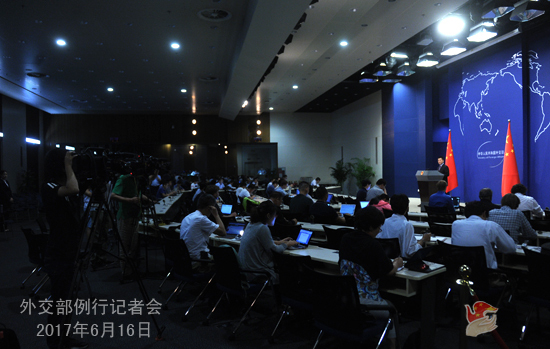 A: The 6th World Peace Forum will be held from June 24 to 25 at the Tsinghua University. Vice Chairman Arken Imirbaki of the Standing Committee of the NPC will address the opening ceremony. There will also be former political dignitaries from other countries and officials from some international organizations at the Forum. Q: It is reported that ROK President Moon Jae-in said during a speech marking the 17th anniversary of the June 15 Joint Declaration that if the DPRK stops making additional nuclear and missile provocations, the ROK can come to dialogue with the DPRK without conditions. The two sides will be able to comprehensively discuss complete dismantlement of the DPRK nukes and the establishment of a peace regime on the Korean Peninsula, as well as normalization of the DPRK-US relations. The Committee for Peaceful Reunification of the Country of the DPRK also put forward three principled positions, namely national independence, end of confrontation and hostility to the compatriots, and ease-up of military tensions. What is your comment on these statements? A: We have noted relevant reports and welcome these positive messages released by the DPRK and the ROK. Descending from the same nationality, if the ROK and the DPRK could improve their relations and move forward reconciliation and cooperation, it would serve the fundamental interests of the two sides and contribute to regional peace and development. Under the current circumstances, we hope that the two sides continue to demonstrate good faith, commit themselves to reconciliation and cooperation, and play a positive role in alleviating tensions on the Peninsula and resuming dialogues and consultations. Q: On June 15, Russian President Putin said at his annual "direct line" call-in session that besides boasting strategic relations, Russia and China have many overlapping goals and complementary opportunities, and there is no doubt that the two countries will work together and this work will be effective. What is your response? A: China appreciates these positive remarks by President Putin on China-Russia relations. China and Russia are each other's most important comprehensive strategic partner. Our bilateral relationship has reached such a high level as never before. Both China and Russia are major emerging market economies. Russia is China's largest neighbor and offers important development opportunities, and vice versa. The two sides are working to translate the high-level political relationship into more practical cooperation results. Under the guidance and leadership of the two heads of state, the two sides are seeking greater synergy between development strategies and between the Belt and Road Initiative and the Eurasian Economic Union, deepening practical cooperation in various fields, and promoting convergence of interests. China would like to work with Russia to actively implement the cooperation consensus reached between the two leaders, deepen all-around cooperation, and strengthen the bonds of common interests so that people in the two countries can enjoy more benefits from the development of the bilateral relationship. Q: US Secretary of State Rex Tillerson recently said that the United States is considering to impose sanctions on the enterprises which have business contacts with the DPRK. What are the comments of the Chinese side? A: Actually, we have answered this question many times in our recent regular press conferences. In principle, we hope that, under the current circumstances, all relevant parties can take the measures which are conducive to easing the tensions on the Korean Peninsula, improving mutual trust between relevant parties, thus creating enabling conditions for relevant parties to come back to the negotiating table and resolve the Korean Peninsula nuclear issue through dialogue and consultation. I believe this remains a pressing task. Regarding the issue of sanction, we have stated many times that all the DPRK-related resolutions of the UN Security Council should be implemented in their entirety. 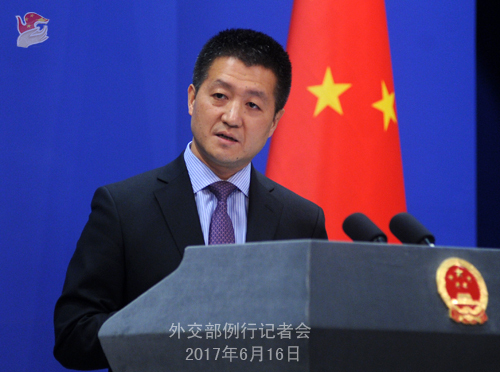 As for the unilateral sanctions imposed by relevant countries outside the framework of the resolutions of the UN Security Council, firstly, the Chinese side never approves these measures; secondly, it is not of our view that these steps are helpful to easing the tensions on the Korean Peninsula and promoting the proper settlement of the Korean Peninsula nuclear issue. Q: The meeting of BRICS Ministers of Foreign Affairs will be held in Beijing on June 19. What topics does China, who holds this year's BRICS presidency, expect to discuss on this meeting? A: We have released relevant information. The first meeting of BRICS Ministers of Foreign Affairs will be held in Beijing from June 18 to June 19. As we all know, BRICS is an organization composed of emerging markets. The meeting will focus on the outstanding issues of the international political and security landscape, major international and regional hotspots and BRICS practical cooperation, and lay the groundwork for the Xiamen summit. We will release relevant information in due course. Q: First, at last week's BRICS political parties' meeting in Fuzhou, a leader of the ruling BJP party in India has said that BRICS should shun double standards especially on issues of terrorism and they should be looking at adopting a comprehensive convention on international terrorism. What is your comment? My second question is about the NSG, which is due to hold a plenary meeting next week. There are reports that at the request of India, the NSG President hopes to discuss this issue of India's entry into the NSG. Can you comment on this particular report and is there any likelihood of change to China's stand on this issue? A: I will take your second question first. We have expounded our position many times. I can tell you that our position has not changed on the admission of new members to the NSG. Regarding your first question, China's position on the counter-terrorism issue is quite clear. We maintain that terrorism is the common enemy faced by all mankind, and we oppose the application of double standards when it comes to fighting terrorism. I believe the BRICS members can have candid and thorough discussions on this issue, because no one believes there should be double standards on the counter-terrorism issue. The fight against terrorism does need the relevant parties to come together and forge synergy on the basis of mutual respect. Q: The US side announced yesterday that it had filed a complaint to fine almost $2 million from a Chinese company called Mingzheng International Trading Limited based in Shenyang, alleging that the company was created to launder money on behalf of sanctioned DPRK entity. I am wondering if you have any response and whether Chinese authorities will take any action against that company or other Chinese companies that the US has raised concern before? A: We have no information on the specific case you mentioned. I want to stress in principle that China has been implementing the Security Council resolutions comprehensively and earnestly and fulfilling its international obligations. As far as we know, the DPRK Foreign Trade Bank as alleged by the US is not on the list of the Security Council sanctions against entities. Just like what I said before, China opposes one country imposing long-arm jurisdiction on the entity of another country in accordance with its own domestic laws. Q: A top Pakistani official stated yesterday that Chinese foreign minister is likely to visit Kabul and Islamabad to improve the relations between Pakistan and Afghanistan. How do you comment on that? Q: The 2nd annual meeting of the board of directors of the AIIB will be held in the ROK. Who will attend the meeting on behalf of China? What is China's expectation for the meeting? A: Chinese Finance Minister Xiao Jie will lead a delegation to the meeting. Since opening up for business, the AIIB has been enjoying all-out support from its members. Therefore, the AIIB really got off to a good start. China looks forward to working with all parties to ensure that the AIIB will make greater contributions to bolstering infrastructure and connectivity in Asia and around the world, and promoting economic recovery and sustainable development. Q: The US allegation is that the Chinese company is working as a front of the DPRK Foreign Trade Bank. Were you saying that because the DPRK Foreign Trade Bank has not been sanctioned by the UN, so even though it has been sanctioned by the US, your position is that it was not engaging in any illegal activity? A: I believe I have made myself clear. As far as we know, the DPRK Foreign Trade Bank as alleged by the US is not on the list of the Security Council sanctions against entities. 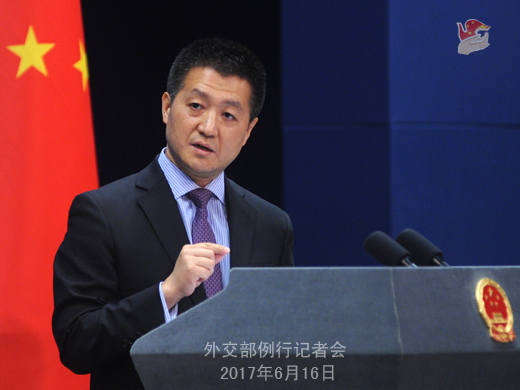 Therefore, China opposes one country imposing long-arm jurisdiction on the entity of another country in accordance with its own domestic laws. Back to the Chinese side, I can also assure you that if any violation is found using Chinese territory against the Security Council resolutions or China's laws and regulations by enterprises or individuals of any country, it is firmly opposed to by China and will be dealt with in accordance with law. Follow-up: will China take any measures to investigate this company or respond to the US compliant? A: Investigation can only be initiated when there is enough evident, regardless of what the issue is. I have said that since this bank is not on the sanction list of the Security Council, we oppose one country imposing long-arm jurisdiction solely based on its own domestic laws. Follow-up: did you mean that the US has never provided any reliable and supportive evidence? A: I cannot make it any clearer. If it is defined as "illegal" in China, it will at least meet one of the following two criteria: first, it violates the UN Security Council resolution; second, it violates China's laws and regulations. Is that difficult for you to understand? Q: What are the expectations of China for the first round of China-US Diplomatic and Security Dialogue (D&SD) to be held in Washington D.C.? A: Like I have said just now, the upcoming first round of China-US Diplomatic and Security Dialogue (D&SD) is based on the consensus reached by Chinese President Xi Jinping and the US president Donald Trump during their meeting in the Mar-a-Lago resort and it is also the first meeting of such an important mechanism. The two sides will utilize this mechanism to have in-depth exchange of views on China-US relations and other important international and regional issues of mutual interest. With regard to the agenda of the D&SD, the two sides are maintaining close communication and it can be sure that major issues of mutual interest that bears on the China-US relations and some international hotspots that concern both China and the United States as two major countries will be covered by the agenda. Q: Do you have any update on the kidnapped Chinese in Pakistan? A: I said yesterday that China and Pakistan are in close contact with each other on this. We have learnt that relevant verification work would soon present some new developments. The Chinese government and people are highly concerned about this issue. 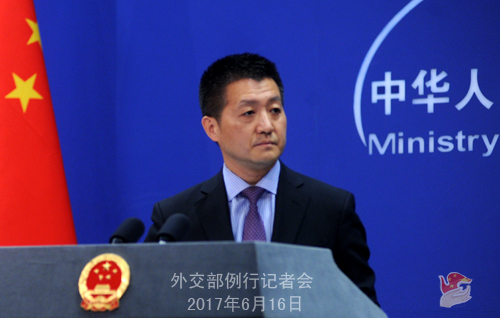 The Chinese Foreign Ministry and Chinese Embassy in Pakistan remain in close touch with the Pakistani side. We hope that we can ascertain the fate of these two young people at an early date. Q: You said at yesterday's press conference that the kidnapped Chinese were used by some ROK religious group for illegal preaching activities. Does this mean they did something they were unwilling to do? A: You can check the transcripts of yesterday's press conference. It was raised by an Indian journalist citing the words of an ROK diplomatic official who said that the ROK denied any involvement in this case. My answer yesterday was that we have noted relevant reports which mentioned that the two kidnapped Chinese and eleven more were used by some ROK religious group for illegal preaching activities in Pakistan in violation of the Pakistani laws and regulations and local customs. Therefore, the Chinese government, first and foremost, is very concerned about the fate of these two young people and is working to verify the situation. And secondly, in principle, the Chinese government always asks its people to observe local laws and regulations as well as local customs and practices when travelling or living overseas, and in this case in Pakistan. If it is found out that these is violation on the side of these Chinese nationals against Pakistani laws and regulations, the Chinese government will coordinate with the Pakistani government to conduct investigation in accordance with law. Follow-up: Does "being used" mean that they were forced to something against their will? A: I have said that we will coordinate with the Pakistani government in relevant investigations. Before the truth is finally established, we shall make no prejudgments. Q: Is there any investigation underway on the eleven people? Are they also involved in illegal preaching? Do you have anything on these eleven people? A: The condition of the two kidnapped Chinese is yet to be verified. So, it is inadvisable to say too much at this stage. As for those reports saying that the two kidnapped Chinese and eleven more Chinese were used by some ROK religious group for illegal preaching activities in Pakistan, I have said that the Chinese government will coordinate efforts with the Pakistani government to carry out investigation in accordance with law.